We estimate that about 3% of the coach-flying population is good at sleeping on airplanes. That figure is 100% made up—but there’s simply no way that more than a minuscule fraction of passengers know how to sleep on a plane comfortably (without a little something, right?). Unless you’re flying first class, your experience at 35,000 feet in the sky is usually limited to a tightly packed seating arrangement with any attempt to doze off interrupted by surrounding passengers bumping into you or your seat, loud conversations, and crying children. Which, when either alone or combined, does not a restful dose of beauty sleep make. So regardless of our imaginary statistic, we know figuring out how to sleep on a plane (without hating your life) is no easy feat. But with summer travels ahead, and especially on long flights, you have to give it your best shot. We always do, and we’ve picked up a few creative tactics along the way that work. Scroll through for seven weird—but effective—ways to sleep on a plane. First and foremost, recline your seat as much as possible. (This will be the backbone of all the sleep positions—except one—to follow.) This is fairly obvious, as you’ve probably discovered sitting up straight is not very conducive to sleep. Lean back (as far as your chair will allow) to relieve lower back pain. Then try one of the suggestions below for added comfort. If you’re traveling with another person, ask them to recline their seat back just not quite as far as yours. This will create a small opening between the two seats for you to wedge your head in. Sure, your travel companion doesn’t get to enjoy the full recline, but it’s better than resting your head on their shoulder. Traveling alone? Pick a window seat on “your side.” If you sleep on your left side at home, pick a seat on the left side of the plane for optimum comfort. (Another bonus of the left side of the plane? We’re not sure how the U-shaped neck pillow came into popularity, because when used as directed, it’s extremely uncomfortable. But if you flip it around so that the opening is at the back of your neck, your neck remains properly aligned and your head gets support. Also, try directing the beads, stuffing, or whatever is inside the pillow to one side (again, to “your side”), and then slide a hair tie around the pillow to hold the stuffing in place. This gives you a little extra cushion to lean on when your head inevitably rolls to one side. We also suggest giving your pillow a spritz of refreshing room spray or applying some relaxing lavender body oil to your skin, because you never know what sort of non-comforting smells you’ll encounter on an airplane. Weleda Lavender Relaxing Body Oil ($14) is a TSA-friendly choice. Not sure how to sleep on a plane when your seatmate has a full-spectrum reading spotlight beating down on your eyeballs? 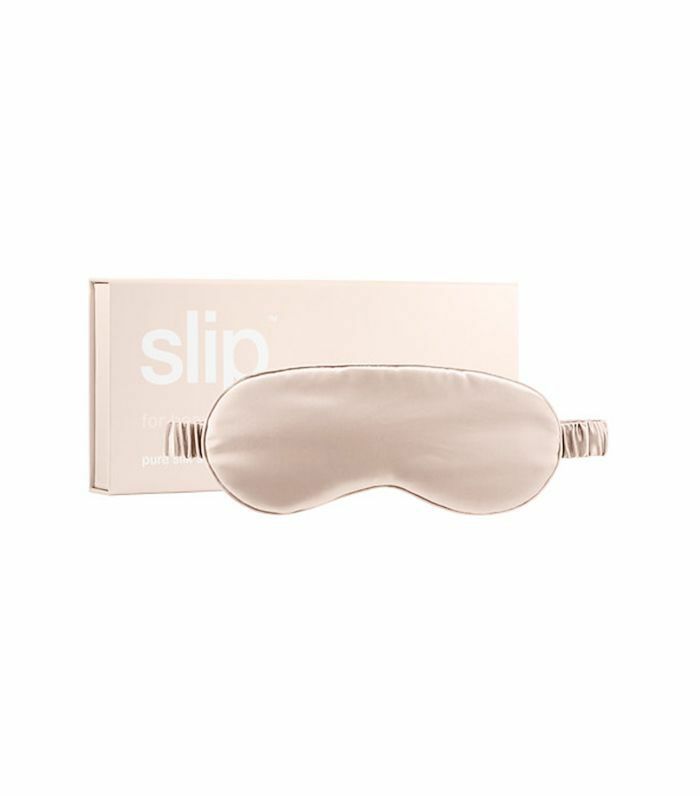 Fear not, you can block out light, and kick-start your snoozing with a luxe silk eye mask that will make you forget you’re on a plane. This one from Slip is a Byrdie HQ favorite. No neck pillow? If you’re on a plane with adjustable headrests, simply fold the flaps inward to keep your head from rolling back and forth, which will eventually jerk you awake. The real key to success with this one is securing an airplane pillow when you board (boarding early pays off). Take that pillow (or a scarf or sweater, if necessary), fold it in half, and place it on one of your shoulders. This functions much like the backward U-shaped pillow, giving your head a place to rest comfortably. Now that your top half is comfortable, focus on the lower half of your body. Part of the reason sleeping while not fully reclined is so difficult is because it puts pressure on your spine—and, of course, there’s the fact that economy class airplane seats are far from luxurious. Sitting on a cushion makes a world of difference (seriously) if you’re trying to figure out how to sleep on a plane with fewer nightmares and more sweet dreams. The U-shaped cutout of Magellan Luxe Self-Inflating Seat Cushion ($39) suspends your tailbone, relieving pressure on your spinal cord, and it makes airplane seats feel a lot less like airplane seats. It inflates automatically and folds up into a nice little pouch, too. In a pinch, sit on your U-shaped neck pillow. Trust us—you’ll feel the difference. 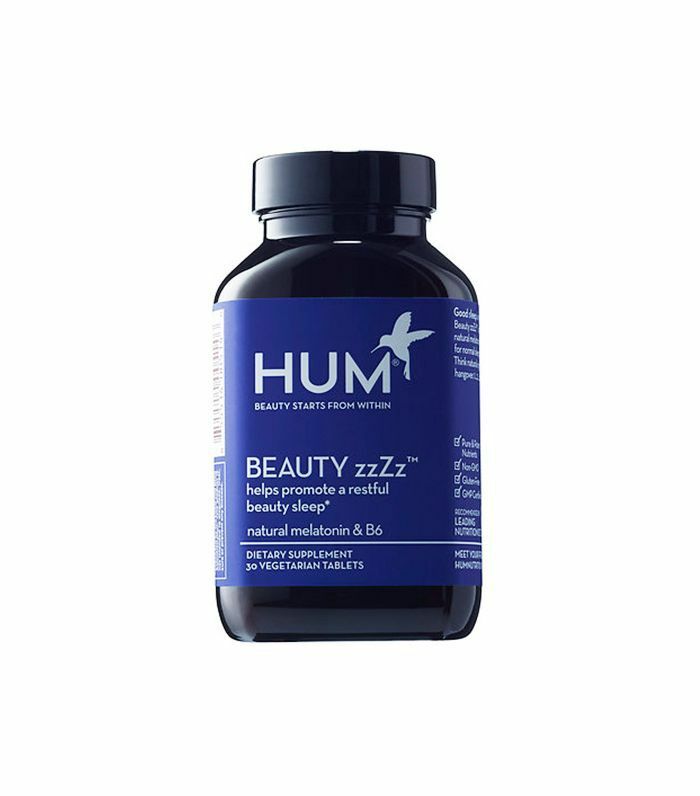 Get a little help taking a rest (and up your beauty game simultaneously) with these supplements. They’re strategically mixed with melatonin and B6 to help you drift off fast—sans sleeping pill. Figuring out what to do with your feet can be tricky. It’s a delicate balance of elevating them in order to bring your body as close to 180 degrees as humanly possible and giving yourself enough legroom to stretch out. In the end, it comes down to personal preference. If you’re tall, keep the area under the seat in front of you free. If legroom isn’t your top concern, use the airplane’s metal footrest (assuming it has one) or your carry-on bag. However, your carry-on bag can’t be so large that it takes up all of the room; there needs to some space for your feet, so plan accordingly. Finally, kick off your shoes. Even the smallest stacked heels can get in the way of restful sleep. As will cold feet, so pack comfy socks, too. Two words: Sprawl out. This is the goal we strive to achieve on airplanes. Keep your eye out for empty rows. If there’s one available, stake your claim, raise the armrests, stretch out over all three seats, and pretend you’re in first class. Now, if there’s only an empty middle seat next to you, there’s still plenty to work with. Short girls, you can curl up. You may get some weird looks from the person in the aisle seat, but it’ll be worth it. If you’re on the taller side, lift both armrests, and flip your body so your back is against the side of the plane. Put your pillow, scarf, sweatshirt, and whatever you have that can serve as a cushion behind your back. Then, wedge your head into the window opening, and cross your legs out on the open middle seat in front of you. (Again, wayward glances may be involved.) Sleeping cross-legged may not be appealing, but for whatever reason, this is one of our best tips (from firsthand experience, of course) for how to sleep on a plan comfortably. 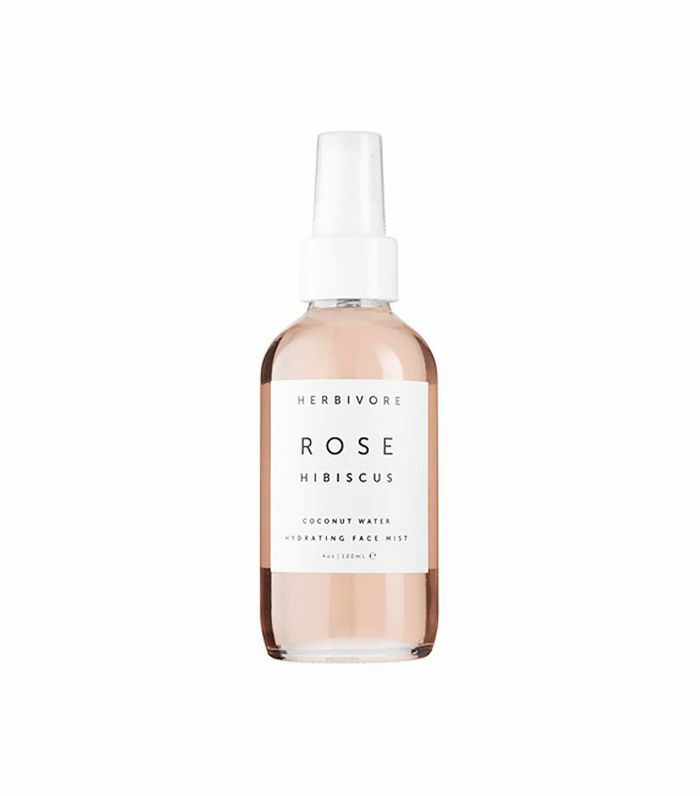 Once you’ve scored some shut-eye, refresh with an invigorating face mist to rehydrate and awaken skin. We keep this one from Herbivore on our desks, by our beds, and, yes, in our correctly sized carry-on at all times. Looking for more helpful sleep tips? See 11 ways a holistic wellness expert would detox your bedtime routine. This story was originally published on April 29, 2015, and has since been updated.